Lip augmentation is a cosmetic procedure that involves lip implants or injection of lip fillers for the purpose of creating fuller lips. Who benefits from Lip Augmentation? Individuals with thinner lips or vertical lip wrinkles seek out lip augmentation to achieve fuller, more voluptuous lips. Ideal candidates for lip augmentation are in good health and can endure the discomfort that follows the cosmetic procedure. Individuals with cold sores, diabetes and blood clotting issues may experience complications and should consult with a primary physician and a plastic surgeon before undergoing the procedure. Lip augmentation involves the injection of filler materials, such as collagen, into the lips. The collagen comes from human materials from deceased individuals. Small incisions are made on the inside of the lip and the collagen is inserted. Collagen injections generally last up to a year. Fat transfer is another technique, which takes fat from another part of the body and injects it into the lips. This is a preferred method for some individuals who feel more comfortable avoiding foreign materials. The body can more easily reabsorb its own fat. Surgical implants are another option, giving the lips a fuller and more youthful look. They are made of synthetic materials and are useful for a more permanent outcome. The risk of allergic reactions does exist with this approach. Another less common, more invasive approach is to surgically remove skin and tissue from the inside of the patient's mouth and insert it into the lips. After receiving an injection filler treatment, a patient will generally experience minor discomfort. Swelling and redness may persist for the first few days. 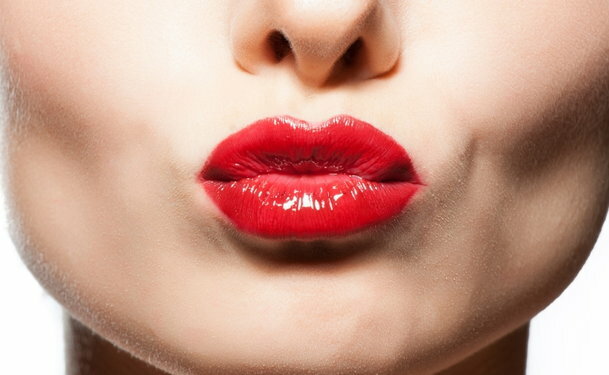 Patients should avoid excessive touching and massaging of the lips for a period of two days. The lips can be soothed using gel ice packs or a washcloth for the first day. Cosmetic usage is allowed following a lip augmentation. A soft-tissue implant treatment requires additional care. Excessive lip movement should be limited when eating. Talking should be kept to a minimum during the first two days. Laughing, smiling, probing the implant using the fingers or the tongue should be curbed during the first week after the treatment. Other activities, such as excessive bending or strenuous exercises, should be avoided for the first week. The patient's sleeping position must also be semi-upright during the first week following the surgery. The risks associated with lip augmentation are possible allergic reactions to the use of anesthesia. If a lip implant is used, a patient may be allergic to the materials used to create the implant. Bleeding and a hardened implant are additional risks, which may result in the removal of the implant and additional surgery. Infection is a possible risk with all surgeries. Nerve damage is also a possibility with a lip augmentation procedure. What are the final results of Lip Augmentation? After a few days of recovery time following lip injections and several weeks after lip implants, the final result is generally fuller and more youthful looking lips.